Do you offer a joint degree program? Students in the Weekend format follow a predetermined set of courses that does not include the dual-degree option. Do you have to be employed? What will my degree read? Masters in Business Administration, University of Michigan-Ann Arbor. Do you offer an Executive MBA program? Yes, the Ross School of Business offers an Executive MBA Program structured to meet the needs of individuals in senior management roles, focusing on leadership skills needed to be successful at the executive level. Specifically, the program targets participants who have had generally 15-20 years of work experience, with significant experience in a managerial/supervisory capacity. 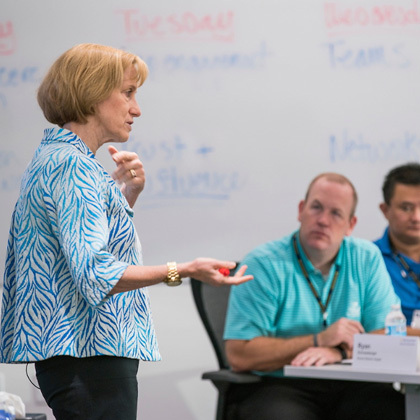 The collective professional experience of EMBA participants enriches the learning experience both in and outside the classroom. Can I use the services provided by the Career Services Department? 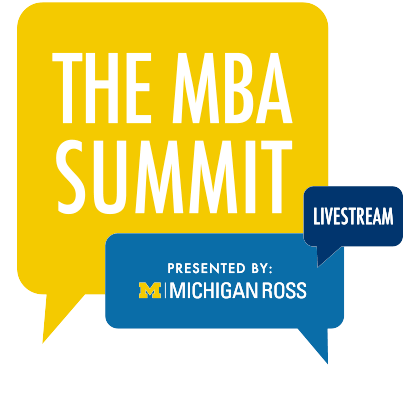 Yes, all MBA students can attend recruiting presentations, Career Services workshops, access iMpact, and use Career Services handouts, seminar videotapes, mock interviews, career consulting, and other services. Part-time MBA students can participate in the on-campus interview process for full-time recruiting during the fall term prior to graduation. However, part-time students cannot participate in on-campus interviews for internships since most part-time students work full-time and with the weekend format and scheduled courses during the spring/summer term, you do not have the flexibility to do a summer internship. Do part-time MBA students participate in MAP? Yes. 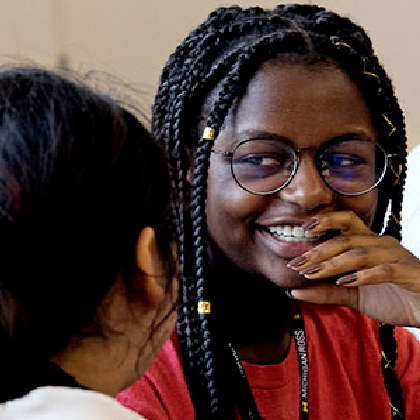 The Multidisciplinary Action Project (MAP) course is a core requirement in the first year of the Weekend format and takes place during the winter term. The course requires a one-week commitment in late February or early March in which the student will work on-site or travel on behalf of the firm sponsoring the student's MAP project. Can part-time students join clubs in Ann Arbor? Yes, part-time MBA students may join student clubs. The latest list of clubs can be found online. How can I arrange for a tour of the Ross School of Business? Prospective students are welcome to conduct a self guided tour of the Ross facilities during regular business hours. Learn more about visiting campus and taking a tour. If you are coming for a Weekend class visit experience, a guided tour will be part of your itinerary. Can I waive out of courses? Course waivers are not an option in the Weekend MBA Format. Can I take courses before the program begins? Can I transfer from one program to another? 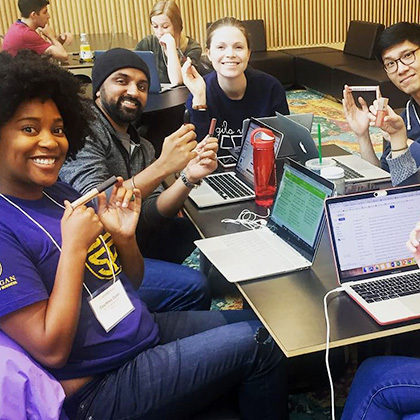 Students may elect to transition from the cohort based Weekend MBA program to the flexible Evening MBA program if they require additional flexibility. It is not possible for students in the Weekend program to transfer into the Full Time MBA or Executive MBA programs. We recommend you apply to the Ross MBA program format that best suits your goals, needs, and schedule. Is it easier to be admitted into the Evening format than the Weekend format? The Admissions Committee looks for the same qualifications for both formats. How does the Weekend MBA Program compare to the Full-Time MBA Program in terms of degree requirements? As much as possible, course material and other content are similar between the two programs. Will we have the same professors as students in the Full-Time Program? Yes, the same professors teach in both programs. Can I take an occasional day class? No, Weekend students take a predetermined set of courses with one cohort of peers. Is the completion of a college-level calculus course a prerequisite to admission to the Weekend MBA program? Ross has no prerequisite courses for admission to the MBA program. However, due to the analytical rigor of the program, it is expected that you have a working knowledge of college-level mathematics, including basic calculus. If you have not had this coursework, we recommend that you take a course that emphasizes business mathematics prior to beginning the program. What should I do if I need an early decision on my application? 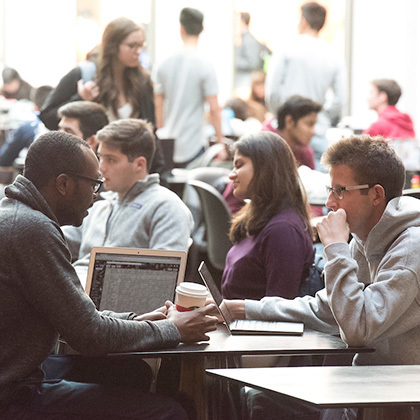 For the Weekend MBA format, admissions decisions are made on a rolling basis and will be provided six to eight weeks from the time a completed application is received. Please time your application to the program accordingly. If you are in a unique situation, please contact our office. Can I reapply if I was not accepted previously? Yes. Reapplication procedures are streamlined if you reapply within one year. You are welcome to re-use portions of your prior year's application (such as GMAT/GRE scores or Transcripts) for your new application. Please contact the admissions office if you would like us to transfer materials forward from a prior application. Can I make an appointment to talk with someone about the Weekend MBA Program? Prospective part-time MBA students can schedule a virtual chat session with the Associate Admissions Director. Please visit our Events Page and filter by Weekend MBA, and look for the events titled Part Time MBA Virtual Chat with the Admissions Director to schedule an appointment. Do you have a required minimum GMAT/GRE and GPA? Minimum required scores and/or grade point average are not used in the admissions process. You are, however, always compared to the current pool of applicants. Is the TOEFL required for non-native English speakers? Non-native English speakers are required to submit a TOEFL or Pearson Test of English (PTE) score as part of the application. Exemptions from submitting a language proficiency score are given if you earned your undergraduate degree at an accredited institution where the sole language of instruction was English or if you have been living, working, and conducting daily business in an English speaking country for two or more years. How many days before the application deadline should I take the GMAT/GRE? We recommend taking the GMAT/GRE test 30 days before the application deadline. Thirty days would allow enough time for the official report to reach the Office of Admissions by the application deadline. If I am scheduled to take the GMAT/GRE less than 30 days prior to the application deadline, will you accept a copy of the preliminary report? If you are doubtful that the official GMAT/GRE score report will arrive by the deadline date, you can upload your unofficial score via your online application, fax your unofficial score report to our office at 734-763-7804, or send it to Office of Admission, 700 East University, Kresge Hall, First Floor East, Suite K1521. Is an interview required for admission? Yes, an interview is required for admission, and is by invitation only. If the Admissions Committee invites you to interview, you will receive the invitation and scheduling information via email. The interview provides the Admissions Committee with more information about you. It is not an indication of the outcome of your application. Interviews are typically conducted by the managing director. Is a three-year undergraduate degree from India acceptable to apply? Yes, we will consider applicants who hold a three-year undergraduate degree from India.